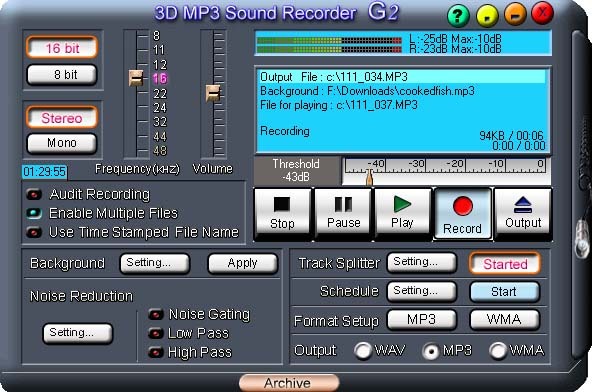 3D MP3 Sound Recorder is a sound recorder software. It enables you to record sound, played back through your sound card,microphone,line in and any other sound sources. You can use it to grab any sound, including music, dialogs from movies, game sounds etc. from your local computer or the internet. Captured sounds can be saved in WAV,WMA or MP3 format, using real-time conversion (without creating temporary files). The program offers direct support for RealPlayer, Winamp, Windows Media Player ,Power DVD ,Flash, Quick time and many others. It also includes a built in WMA,WAV/MP3 player, so you can listen to your recordings immediately after you finished recording. Additional features include a time-based recording mode, that will automatically stop recording after a user-specified time, automatic line detection and more. Another 2 very useful features: signal recording mode which can detect sound signal on your computer and will pause, stop or create new files trigged by sound signal according to your settings, time schedule recording mode which you can record for specified periods of time automatically with different streaming URLs.